at number 18: What would revolutionise my 2013? I've just spotted the Confused.com blogger competition to help you revolutionise and de-stress your life in 2013, and you can win the gadget of your choice! Now, this is so simple for me, there has been a gadget I have wanted for ages and never had the funds to buy it. "I want to stand on that chair" "No! I was there first" "He's pushing me" "No he's pushing me" " Can I crack the eggs" "No he did it last time, I want to do it this time" "He's pushing me again" "I'm not" "Can I do the flour" "No I want to do the flour, you do you sugar" "Can I stir" "Can I use the hand blender" "It's my turn let me have a go" "I've only had it 2 minutes" OH I could go on but it's actually stressing me! Most of you are probably thinking well why on earth do you do it. Well, past all the arguing and bickering they do enjoy it, and obviously its a great way of learning all different skills. And at the end the cakes taste delicious. It will set you back a whooping £429 at Lakeland. But you will have stress free baking! An Artisan Kitchen aid mixer... ahhhh heaven. So sometimes I have to stop mixing and the meringue goes wrong and we end up with plain icing and a very messy kitchen!! I started these cakes when my helpful children went to bed! Meaning starting at 7.30pm, they both had 16 eggs! Imagine the arm ache, not only that it takes forever, I tend to make them one night and ice them the next, if I had a mixer I could get to work on the icing while the sponge is mixing, then I wouldn't have the stressful 'icing period' the next day rushing to get it finished before midnight. 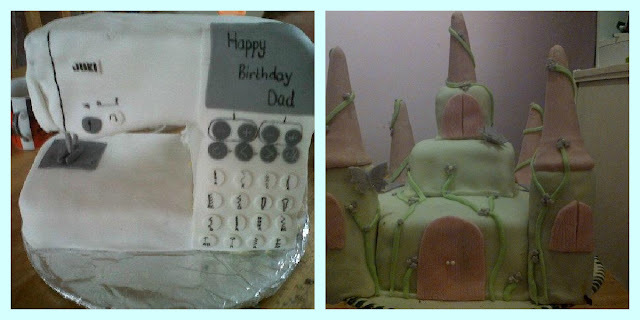 I didn't actually finish the sewing machine cake until the afternoon of my dad's birthday... STRESSFUL! If I had one of these I can imagine stress free baking with children, excitedly waiting to drop there chosen ingredients in to the bowl, willing to take turns and wait nicely. Sharing and laughing and enjoying. Who I am kidding, they will find something to bicker about! But I can imagine, tucking them up in bed, hurrying down the stairs, and get to work on cakes quickly and efficiently, enjoying, tasting, smelling and listening just to the whir of the cake gadget at work. Bliss!